The United States Supreme Court is the only court in the United States without a clearly defined ethics code. In the wake of the controversy over possible leaks from justices’ chambers following the decision in NFIB v. Sebelius, and in light of legislation recently introduced in Congress, this paper suggests two reforms for the Supreme Court. First, the time has finally come for the Court to adopt a comprehensive Code of Conduct. Second, the Court should alter its current recusal practice – in which decisions are made exclusively by individual justices – and instead resolve disqualification motions by a vote of the full court. 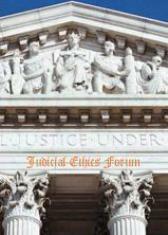 Steven Lubet & Clare Diegel, Stonewalling, Leaks, and Counter-Leaks: Scotus Ethics in the Wake of NFIB v. Sebelius (Sept. 10, 2012). The great Malia Reddick, now the Director of the Quality Judges Initiative at the IAALS at Denver University, pulls together an interesting running collection of judicial selection news across the states. Topics include merit selection bills, retention election battles, campaign spending, and many more. For the collection, click here. To sign up for email updates, click here (and choose Selection Snapshots Newsletter). For centuries, legal theorists and political philosophers have unsuccessfully sought a unified theory of judging able to account for the diverse, and oftentimes conflicting, responsibilities judges possess. How do we reconcile the call of judicial independence — a function of a judge’s obligation to uphold the rule of law — with that of judicial responsiveness — the obligation that, as a branch of government in a democratic polity, judges must ensure that the law not derogate too far from the will of the people? This paper reveals how the law governing fiduciary relationships sheds new light on this age-old quandary, and therefore, on the very nature of the judicial office itself. In so doing, the paper first explores the routinely overlooked, yet deeply embedded historical provenance of our judges-as-fiduciaries framework in American political thought and in the framing of the U.S. Constitution. It then explains why a fiduciary theory of judging offers important insight into what it means to be a judge in a democracy, while providing practical guidance in resolving a range of controversial and hotly contested legal issues surrounding judicial performance, such as judicial ethics at the Supreme Court, campaign contributions in state judicial elections, and the role of public opinion in constitutional interpretation. For the full article, click here; Leib et al., A Fiduciary Theory of Judging, 101 Cal. L. Rev. (forthcoming 2013). Something good and something bad happened recently in government and judicial ethics; no one has truly noticed yet for some reason. The Supreme Court all but banned First Amendment analysis as applied to recusal laws, both legislative and judicial. That, actually, is the good thing, or so I argue. The bad thing is that the Court, in doing so, used a geriatric approach to constitutional theory. The approach is unduly reverent of anything “old;” and old is not limited to the practices of the Founding Fathers, but also includes “traditional” practices within some undefined range. But what is old is not necessarily wise, and a theory to the contrary leads to degenerative results in general and in ethics in particular, or so I argue further. I conclude with a return to the positive, hoping that the Court’s path may have inadvertently sparked a viable conceptual foundation for judicial recusal law and practice, which of course, have received much general press and scholarly attention of late. For the full essay, click here; Keith Swisher, Recusal, Government Ethics, and Superannuated Constitutional Theory, 72 Md. L. Rev. (forthcoming Dec. 2012). Scholars have traditionally analyzed judicial impartiality piecemeal, in disconnected debates on discrete topics. As a consequence, current understandings of judicial impartiality are balkanized and muddled. This article seeks to reconceptualize judicial impartiality comprehensively, across contexts. In an era when “we are all legal realists now,” perfect impartiality — the complete absence of bias or prejudice — is at most an ideal, with “impartial enough” becoming, of necessity, the realistic goal. Understanding when imperfectly impartial is nonetheless impartial enough is aided by conceptualizing judicial impartiality in three distinct dimensions: A procedural dimension in which impartiality affords parties a fair hearing; a political dimension in which impartiality promotes public confidence in the courts; and an ethical dimension in which impartiality is a standard of good conduct core to a judge’s self-definition. The seeming contradictions that cut across contexts in which judicial impartiality problems arise, can for the most part be explained with reference to the dimensions those problems inhabit and the constraints under which regulation in those dimensions are subject. Thus, being impartial enough to assure parties a fair hearing in the procedural dimension may or may not be impartial enough to satisfy the public in the political dimension, which may or may not be impartial enough to ensure that judges are behaving honorably in the ethical dimension. Analyzing partiality problems through the lens of the dimensions they occupy not only resolves many of the imponderables that have long plagued the subject, but also reveals a distinct trend, in which impartiality is being transformed from a value traditionally regulated largely by judges and the legal establishment in the procedural and ethical dimensions, to one that is increasingly the province of the political dimension, where it is regulated by the public and its elected representatives. By situating impartiality at the crossroads of judicial procedure, ethics and politics, this article offers a new perspective, not just on judicial impartiality, but also on the role of the American judiciary in the administration of justice and the political process. Although admittedly old news by now, Chief Justice Roberts used his annual report to defend his Court’s indefensible lack of a judicial ethics code. His defenses playfully distill into these three: (1) the other justices and I are good people so we do not need binding rules; (2) we and our court are special; and (3) ethics codes cannot guarantee ethical behavior (only the good people mentioned in (1) can do that). The principle of “a government of law and not of [wo/]men” was reversed. The opinion is worth a close read for many reasons, only two of which follow. (It is interesting, for example, that the Committee twice criticizes the Sixth Circuit for failing to investigate fully the matter and thus basing its decision on incomplete information; the Committee then does nothing further and bases its decision on the same information. But let’s leave that problem for another day and focus on the content of this important opinion.) First, the opinion is worth reading for the footnotes. As is often the case, textual footnotes are among the most thought-provoking (or sometimes mind-numbing) part of opinions. On the point that the Sixth Circuit’s investigation was inadequate, for example, the Committee expressed regret that the Sixth Circuit “appeared to resolve ambiguities in the record against the complainant.” The Committee’s point is a good one, but is it clear that ambiguities (which invariably exist and persist) should be resolved in favor of complainants? Perhaps the answer to that question should vary with the Canon at issue. For Canon 2C, for instance, the respondent judge has voluntarily chosen to join or remain in the allegedly discriminatory organization, the judge will presumably have the best access to the organization’s membership rosters and policies, and the Canon is concerned in part with appearances. In those circumstances, then, perhaps it might be permissible to shift the burden to the judge to prove that the organization does not discriminate — and perhaps that the organization also does not reasonably appear to discriminate. Canon 2C’s official commentary, on which the Committee later relied and built, does contain a form of burden-shifting when a judge joins or remains in a non-diverse organization, if “reasonable persons with knowledge of all the relevant circumstances would expect the membership would be diverse in the absence of invidious discrimination.” “Relevant factors” in that regard “include the size and nature of the organization and the diversity of persons in the locale who might reasonably be considered potential members.” Here is the Committee’s application: “Nashville, Tennessee, is one of the major cosmopolitan cities of the Southern United States. In particular, it boasts a 27% African American population. Its female population is just over 50%. Although few organizations perfectly mirror the population trends of their surrounding locales, a member of the public would reasonably expect to see at least some women and African Americans among Belle Meade’s Resident Membership barring (1) invidious discrimination or (2) something unique about the Club — ‘such as that the organization is dedicated to the preservation of religious, ethnic or cultural values of legitimate common interest to its members,’ [Canon 2C Commentary] — that would suggest otherwise. There is, however, nothing about Belle Meade’s stated aims or activities that provides any such justification for the total absence of any female or African American Resident Members. . . . Naturally, there is no shortage of women or — as Judge Paine proclaimed in his 1990 letter to the Club’s Board — African Americans fitting that description.” Thus, absent someone (presumably Judge Paine) coming forward with proof to the contrary (which is obviously unlikely in this case because Judge Paine believed that the club’s policies were indeed problematic), the judge’s membership may be determined to be misconduct. Later in the footnotes, the Committee also conceded a bombshell: “To our knowledge, Canon 2C has never before been enforced.” To place that statement in its context, Canon 2C, in its current form, has been on the books for twenty years. Now, such shocking statements permit one’s optimistic or pessimistic nature to come out: judicial ethics regulation has finally matured to the point of enforcing a critical rule (and hopefully others like it) designed to ensure an actually and apparently impartial judiciary; or judicial ethics regulation has failed for twenty years to enforce such a critical rule. Indeed, on the pessimistic side of the ledger, it is noteworthy that — despite finding a violation of Canon 2C — the Committee failed to impose any discipline: because Judge Paine has expressed an intention to retire soon, and “because this decision represents the first enforcement of Canon 2C, there is no cause at this point for us to take disciplinary action.” (Indeed, the Committee went further, proclaiming that the judge will retire with his “reputation . . . intact.”) I have noticed this phenomenon several times in discipline decisions involving both lawyers and judges, although most of the cases are older ones. The idea seems sound in a common-law based sanction regime: we should apply the (new) rule only retroactively because, in part, respondents necessarily could not have had notice of the rule in advance to guide their conduct. The idea seems significantly less sound in a code-based sanction regime (i.e., the one that we have had for a long time): Canon 2C has always been publicly available and has always prohibited this behavior by its terms. Why, then, do we give the first respondent a free pass? We can come up with a few reasons, but because the Committee offered none (save the impending retirement), we have no one with which to argue. Tweet, poke, post, friend, like, blog, link, comment, and share: the opportunities to communicate electronically using social media tools seem never ending. Facebook, Twitter, YouTube, MySpace, and LinkedIn are just a few of the social media sites that allow people to communicate and “connect” with others across the world in seconds. E-mail and sending text messages are two other ways to communicate electronically, but neither e-mails nor text messages can keep up with the speed, accessibility, and popularity of social media. Social media is entrenched in our lives as evidenced by the fact that adult profiles on online social media sites are up from only 8% in 2005 to 47% in 2010. The legal profession has also jumped aboard the social media bandwagon with 40% of judges reporting they are on social media sites and 56% of attorneys reported having a presence on social media sites. Whichever “social networking” or communication method is chosen by an individual, the technology has made that communication instantaneous. Unfortunately, social media communication is also dangerous to the integrity of the courts. Emily M. Janoski-Haehlen, The Courts Are All a‘Twitter’: The Implications of Social Media Use in the Courts, 46 Val. U. L. Rev. (forthcoming 2011). Some press coverage follows: New York Times; Wall Street Journal; and The Tennessean. In a recent House budget hearing, Supreme Court Justices Breyer and Kennedy responded to questions from Rep. Jose Serrano (D-NY) regarding recent calls to bind the Supreme Court to the Code of Conduct for United States Judges. Justice Kennedy responded first by stating the “Code of Conduct does apply to [us], in the sense that we have agreed to be bound by them.” He further stated that following the rules of ethics is “part of our oath and part of our obligation.” Justice Kennedy went on to caution, however, that it would be “structurally unprecedented” and a “legal problem” for the Judicial Conference of the United States (composed of district and circuit judges) to bind the Supreme Court to its rules. A video recording of the hearing can be seen here (the relevant testimony runs from approximately minute 26:00 through minute 33:00).